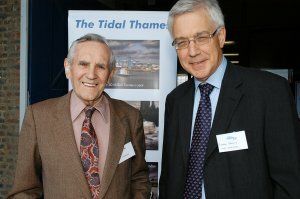 Bob Briscoe, 96, the oldest PLA pensioner at the gathering at Tilbury Cruise Terminal on 20 May and PLA chief executive, Richard Everitt. Mr Briscoe worked for the PLA from 1928 to 1971, starting as a messenger boy. He later worked in the Royal Docks and ended his career in the research department in the then PLA head office in Trinity Square, London. More than 500 former Port of London Authority employees gathered by the Thames to mark the organisation's 100th birthday on 20th May 2009. The pensioners - which include staff from all parts of the PLA included dockers and port police officers - met up to hear how Britain's second biggest port and busiest inland waterway has changed over the years. The event was staged at the Tilbury Cruise Terminal, a venue more accustomed to hosting around 20 ocean liner visits a year. "The Port of London and the PLA have changed considerably over the years as a result of technological changes in ships and cargo handling . But the Port is as important to London and the south east today as it’s always been. "It's thanks to the efforts of our pensioners and the people who currently work on the river, that London is the modern 21st century port we have today." The pensioners' party was just one in a series of celebrations to mark the PLA’s centenary which has included the publication of a history book, a charity-driven dragon boat race for the port community, and a fundraising concert for the Royal National Lifeboat Institution. More images from the event are available here.